New minimally invasive energy-based probe ablative technologies are currently being applied to nephron-sparing surgery. Laparoscopic ultrasonography is used for precise placement of the ablative needle probe and real-time monitoring of cryoablation or other ablative procedures for the small renal tumor. Cryoablation remains the most well-studied ablation alternative, especially laparoscopically (18-22). 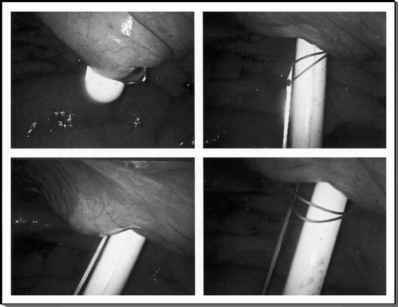 The first percutaneous application of cryosurgery for two patients with renal tumor was reported by Uchida et al. in 1995 (23). Intraoperative ultrasound provides excellent real-time visualization of the edge of the evolving ice ball, which itself is anechoic. This leading edge is clearly identified as a hyperechoic rim at the interface between frozen and unfrozen normal renal tissue. The use of end-fire laparoscopic ultrasonography probe has been reported to guide renal cryoablation (24); however, because the deepest margin of the mass is most at risk for incomplete freezing, use of a flexible side-fire laparoscopic ultrasonography probe positioned on the renal surface opposite to the tumor is preferable (25). By contact scanning from the renal surface opposite to the tumor, the deepest margin of the tumor is visualized; real-time visualization of obliteration of the deep margin of the tumor by the enlarging hyperechoic rim of the growing ice ball is one of the intraoperative parameters determining adequacy of cryoablation. Chosy et al. (26) reported that complete renal tissue ablation occurred at temperature around — 20°C, and Baust et al. (27) showed that tissue destruction is achieved at 5-6 mm inside the edge of the advancing ice ball. Because injury of adjacent normal structures (such as the intestine, colon, pancreas renal hilum, and ureter) is a major concern, laparoscopic approach using real-time laparoscopic ultrasonography seems to be the safest approach for accurate targeting and reliable monitoring, with the advantage of surgically retracting organs and preventing incidental cryoinjury (22). Gill et al. reported their experience with laparoscopic renal cryoablation in 56 patients for a mean tumor size of 2.3 cm. Over a follow-up of three years, average percent reduction in cryolesion size was 77% compared with the cryolesion size on postoperative day 1. No cryolesion could be identified in 38 patients at three years (19). Follow-up computed tomography-guided biopsy revealed persistent renal tumor in two patients, both of whom subsequently underwent uncomplicated laparo-scopic radical nephrectomy, and who are currently alive with no evidence of disease. The longest and most rigorous clinical report of laparoscopic ultrasonography-assisted laparoscopic cryosurgery reported by Gill et al. has established the essential role of real-time laparoscopic ultrasonography monitoring during laparoscopic renal cryotherapy (19). Radio-frequency ablation is being applied clinically in the treatment of small renal tumors (28-30). The radio-frequency ablation needle can be delivered percutaneously or laparoscopically, with progression of treatment being visualized under real-time ultra-sonography. During ultrasound-guided radio-frequency ablation, the tumor surrounding the electrode becomes variably and irregularly hyperechoic, which usually resolves within minutes of initiating radio-frequency ablation; these ultrasonographically visible changes are thought to be due to microbubbles generated during tissue ablation. It is essential to recognize that real-time ultrasound monitoring of the evolving radio lesion is unreliable and inaccurate. Variations in the extent of renal tissue damage, unpredictable complication of skin damage, and difficulty in assessing adequacy of treatment have prevented the wider spread use of percutaneous high intensity-focused ultrasound for kidney cancers compared to transrectal high intensity-focused ultrasound for the prostate. Laparoscopic ultrasonography may be helpful for laparoscopic localization and drainage of difficult renal cysts. lation algorithm applied to radiofrequency ultrasound echo signal data acquired at discrete intervals during heating (31). High intensity-focused ultrasound for renal cell carcinoma is yet an experimental treatment modality. The first application of high intensity-focused ultrasound for four human renal tumors was reported by Vallancien et al. in the early 1990s (32,33). Vallencien et al. observed a hyperechoic spot with a back shadow, which appeared at the focal zone during high intensity-focused ultrasound insonation and which disappeared within a few minutes thereafter. The increased echogenicity of the insonated tissue may be related to a cavitation effect, which generates highly echogenic gas bubbles in the tissue. However, the appearance of such a hyperechoic spot does not guarantee adequate treatment. Accuracy of percutaneous high intensity-focused ultrasound effect may be limited by interference with the rib and by respiratory movement. Variations in the extent of renal tissue damage, unpredictable complication of skin damage, and difficulty in assessing adequacy of treatment have prevented the wider spread use of percutaneous high intensity-focused ultrasound for kidney cancers compared to transrectal high intensity-focused ultrasound for the prostate (34). Recently Paterson et al. developed and tested in the minipig model a laparoscopic probe that allows real-time ultrasound imaging during partial renal ablation using high intensity-focused ultrasound (35). This laparoscopic probe provides ultrasound imaging and energy delivery through the same probe. Thus, high intensity-focused ultrasound energy can be applied with direct contact on to the exterior surface of the kidney tumor under laparoscopy.